How was everyone's Thanksgiving? I hope you all ate your fill of turkey, stuffing and cranberry sauce -- I know I did! 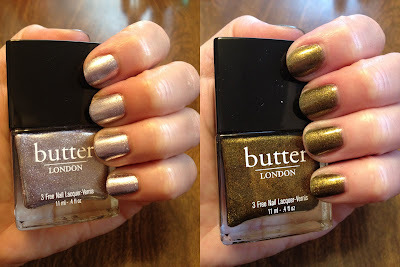 Today I have swatches of two amazing butter LONDON nail polishes for you. Wallis is one of those colors I lusted after for the longest time, and when I finally bought and tried it, it was everything I hoped it would be. The first time I saw it was backstage at the Betsey Johnson show, when butter LONDON's founder Nonie Creme told me she was inspired by Wallis Simpson. I absolutely love this color -- it's an antiqued olive gold with a glittery finish. It's just stunning in person. Lillibet's Jubilee is a really pretty shimmery lilac/silver hybrid. It's interesting because in the bottle, it looks like glitter, but it applies with a metallic foil finish. This nail polish was created in celebration of the Diamond Jubilee of Queen Elizabeth II earlier this year, and it's certainly celebratory! I wear this color a lot when I have a special event -- it's blingy and attention grabbing but somehow refined at the same time.